Hold is a handy trick for your dog to know. You can use it for many different objects and situations, from holding a spatula to pose next to the barbecue grill to holding a pencil while you ﬁnd some paper. 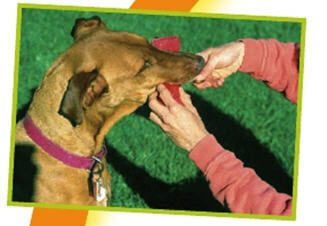 Start with a simple object that’s easy for your dog to hold in his mouth, like a stick or a big wooden spoon. Hold it horizontally in front of you. When he touches it with his nose, click and treat. Repeat several times. When your dog can do this reliably, wait until he puts his mouth on the stick. You may have to wait a bit, but eventually he will get impatient and grab it. When he does, click and treat. Repeat this several times. Now you can ask him to take the stick in his mouth. He should catch on fairly quickly. When he is taking the stick in his mouth regularly, you can add your cue. Tell him “take it” before you offer the stick each time, and don’t forget to reward him when he does it right! Once your dog is taking the stick consistently on your cue, you can start asking him to hold on to it. This is easier to do without the clicker because the clicker gets many dogs excited and they open their mouths. Have him take the stick. When he has it, gently tilt his chin up with your hand and say “hold.” Wait just an instant, then say “give” or “drop it ” and give him his treat. Repeat several times. Work on getting him to hold the stick without your hand being there as a reminder. When he has a reliable hold with you close by and standing still, you can try walking around him. Be sure that whatever you ask him to do is fair. For example, don’t walk out of the room and expect him to still be holding the stick a few minutes later. At this point, you can begin introducing the hold with other objects.